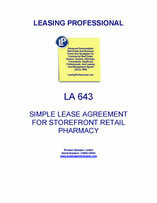 This simple lease form is for a storefront retail pharmacy or drugstore lease. In addition to the stipulated rental, the tenant is obliged to pay for all insurance, taxes, and utilities for the leased premises. The tenant is also obligated to maintain the interior and exterior of the premises. THIS AGREEMENT (the "Lease Agreement") is made effective the _____ day of ______, 20__, between PHARMACY CORPORATION, INC., a __________ corporation (the "Landlord"), and PHARMACY BUYER, LLC, a __________ limited liability company (the "Tenant"). 2. Term. The term (the "Lease Term") of this Agreement will be ten (10) years, commencing on _________, 20__, and ending on ______, 20__. 3. Rent. The Tenant agrees to pay to the Landlord as rent (the "Rent") for the Leased Premises monthly installments of ___________ Dollars ($______), payable without offset or deduction in advance on the first (1st) business day of each month during the Lease Term. If the commencement date or the expiration date of the Lease Term is a date other than the first day of the month, the rent for the month in which such date occurs will be prorated based on the actual number of days in such month. 4. Insurance. The Tenant will, at all times during the Lease Term, and at the cost and expense of the Tenant, carry and maintain fire and extended coverage insurance and public liability, bodily injury and property damage comprehensive insurance (collectively, "Tenant’s Insurance"), all in form and amounts and with such insurance companies as may be reasonably acceptable to the Landlord. Tenant’s Insurance will name the Landlord as an additional insured. Originals or copies of original policies (together with copies of the endorsements naming the Landlord) and evidence of the payment of all premiums of such policies will be delivered to the Landlord upon the execution of this Lease by the Tenant and on each anniversary thereof. Tenant’s Insurance will provide that it may not be terminated or amended except after thirty (30) days’ prior written notice to the Landlord. 5.Taxes. Tenant will pay all real estate taxes relating to the Leased Premises and for all taxes, assessments, and other governmental charges which relate to the business operated in the Leased Premises, including sales taxes and personal property taxes. 6. Utilities. The Tenant will pay for all utilities which it uses on the Leased Premises. 7. Maintenance. The Tenant agrees to perform the customary routine maintenance and service to the Tenant’s improvements and the interior surfaces of the walls, floors and ceilings as well as routine maintenance and repairs of the plumbing fixtures and heating and air conditioning systems, exterior signs for the business and those portions of the parking area requiring maintenance and the cutting or removal of weeds. The Tenant will also be responsible for any snow removal on the walkways or the parking area as well as any striping for parking spaces used by customers. The Landlord will be responsible for the replacement of and major repairs to the heating and air conditioning systems if needed. Notwithstanding the foregoing, the Tenant will be responsible for repairing any part of the Leased Premises damaged by the intentional or negligent actions of the Tenant or the Tenant’s invitees or guests. The Tenant will not commit or allow any waste to be committed on the Leased Premises by the Tenant or the Tenant’s invitees or guests. 8. Use and Inspection. The Tenant agrees to use and occupy the Leased Premises as a retail pharmacy selling prescription drugs and related merchandise in compliance with all applicable laws, ordinances and regulations. The Tenant hereby grants to the Landlord the right to enter and inspect the Leased Premises at reasonable times during normal business hours with prior reasonable notice, provided that, for purposes of complying with pharmacy access laws, the Landlord agrees that the Landlord or its agents will only access the Leased Premises when accompanied by a pharmacist employed by Tenant. 9. Quiet Enjoyment. The Landlord warrants that the Landlord is the owner of title to the Leased Premises (subject to encumbrances, easements, restrictions and mineral interests previously reserved or conveyed of record) and has full right and authority to execute this Agreement. The Landlord covenants that the Landlord will warrant and forever defend the rights of the Tenant to exclusive possession and quiet enjoyment of the Leased Premises against all persons claiming under the Landlord so long as the Tenant pays the rent herein reserved and performs the other obligations of the Tenant under this Agreement. 10. Alterations. The Tenant may make any alterations to the Leased Premises of a minor, temporary, decorative nature at the Tenant’s expense, so long as any single such alteration does not exceed a cost of _________ dollars ($____). Tenant will make no other alterations or additions to the Leased Premises without the Landlord’s prior written consent, which consent will not be unreasonably withheld or delayed. The Tenant will pay all costs of any approved remodeling of or changes to the Leased Premises which the Tenant desires to make. Except as otherwise provided herein, any permanent alteration to the Leased Premises will become a part of the Leased Premises and will remain part of the Leased Premises after the termination of this Lease Agreement. 11. Tenant Fixtures. On termination of this Lease Agreement, the Tenant will be entitled to keep and remove from the Leased Premises all of the Tenant’s equipment and trade fixtures.